Lycopene is a natural red pigment, which tomatoes owe their red color to. It falls into the group of flavonoids. Tomatoes are rich in lycopene. This component increases when cooking, therefore cooked tomato sauce presents higher dosages in this component than fresh tomatoes. Plants have develop lycopene to protect themselves from the effects of light and air oxidation. With properties similar to beta-carotene from carrots, lycopene has anticancer properties that derive from its antioxidant value, since this component is the one with higher antioxidant power of all. 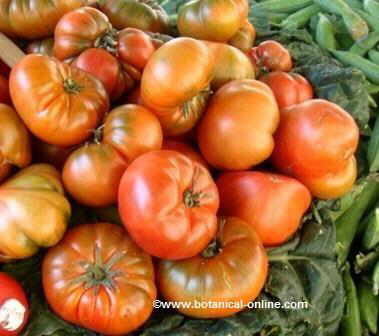 Lycopene appears to reduce the chances of cancer of prostate, lung, stomach, bladder and cervix. Also it has properties of lowering blood cholesterol and preventing inflammation of the prostate. Foods rich in lycopene are very suitable in the diet for hypertension, and, in general, for all those people who must guard his heart. It appears in fresh tomatoes, but especially in cooked ones, since cooking helps free this element and facilitate the absorption by the body. Eating homemade tomato sauces or any food cooked with tomato sauce can be a good way of health care. It is also found in other plants such as: watermelon, peppers, persimmons, carrots, papaya, pumpkins, Goji berries, grapefruit, or rose hips. You can also obtain lycopene from lycopene supplements. The usual doses are between 5 to 15 mg daily in tablet form. Pregnant or lactating women should not take lycopene supplements. In any case, and for everybody, it is best to acquire this principle through diet foods.